Editor’s Note: This is a continuing series profiling Virginia’s colleges and universities. “Invent the Future,” the tagline Virginia Tech adopted in 2006, is more than a slogan. It’s becoming a fact. The university is developing self-driving cars, discerning how our brains work, discovering ways to make cancer cells more receptive to treatment and even engineering batteries that run on sugar. Scientists and students at the university are participating in these projects and thousands more. Tech’s involvement with research skyrocketed during Charles Steger’s presidency from 2000 to 2014. Tech moved up from 51st to 39th in the National Science Foundation’s annual survey of higher-education research expenditures, with $518 million in NSF-reported spending in 2014. Tech’s eight colleges, seven research institutes and hundreds of complementary centers and labs tackle many diverse projects, including sponsored research conducted or directed by Tech employees but paid for by a company or government agency. Through Tech’s Office of Sponsored Programs, 2,950 proposals worth $1.3 billion were submitted in 2014 for projects that included collaboration with more than 300 companies, as well as a dozen branches of the federal government. The Department of Defense accounted for 22.1 percent and the Department of Transportation for 10.8 percent of research expenditures. Researchers obtained 19 U.S. and 15 foreign patents. Ray Smoot, a 1969 Tech grad and CEO of the Virginia Tech Foundation from 2003 to 2013, remembers the skepticism that greeted early research aspirations. In his inaugural address, Steger announced plans to make Tech a top-30 research university. “Many people at the time shook their heads and said, ‘That’s a great goal. But there’s no way,’” Smoot recalls. Steger didn’t quite reach his goal during his tenure but he came close. His successor, Timothy Sands, plans to continue the momentum. In 2000, Tech’s research portfolio was $192.7 million. Soon after, the Virginia Bioinformatics Institute (VBI) opened in Blacksburg’s Virginia Tech Corporate Research Center and now has more than 250 experts in information biology, as well as $68 million in grants and contracts. One of VBI’s latest developments is a computer-aided design tool, GenoCAD. It creates a genetic language for plants to influence crop yield and drought resistance. VBI studies also are unraveling the genomes of disease-carrying viruses and modeling the spread of flu pandemics. During Steger’s presidency, Tech also opened the Institute for Advanced Learning and Research in Danville in 2004 and the Virginia Tech Research Center-Arlington in 2011. Both created opportunities for partnerships with corporate research agencies in different parts of the state. Virginia Tech Carilion Research Institute in Roanoke, which opened along with a research-focused medical school in 2007, has embarked on a long-term brain analysis study seeking information about headline-making neurological health concerns such as dementia, autism, depression and substance abuse. Understanding how genetics and environment contribute to the brain’s decision-making strategies is the goal. Brain Study is using brain-imaging data, combined with genetics and behavior studies, to track decision-making in a target participation of 5,000 healthy subjects, ages 18 to 85. Among the research institute’s many other health studies is one noted in November’s online publication of Cancer Research (cancerres.aacrjournals.org), the scientific journal of the American Association of Cancer Research. Researchers in Roanoke discovered a way to make drug-resistant glioblastoma cells sensitive to chemotherapy. Glioblastoma, which accounts for nearly half of all brain cancers, caused the death of Beau Biden, the son of Vice President Joe Biden. It is typically resistant to a chemotherapy agent called temozolomide, or TMZ. Researchers treated human glioblastoma cells with a combination of aCT1 and TMZ and found that the diseased cells began responding to TMZ. Researchers still don’t understand exactly how the combination works, but they suspect it alters the signaling pathways of the cells. While the treatment won’t cure glioblastoma, Gourdie and his colleagues hope that continued study will enhance survival rates for this and other types of tumors. To manage its vast portfolio, Tech has a four-member leadership team — headed by a new team leader. Theresa Mayer, a leading nanotechnology researcher and associate dean for research and innovation at Penn State’s College of Engineering, was selected to direct Tech’s Office of Research and Innovation in December and will formally begin work Jan. 18. Mayer received a bachelor’s degree in electrical engineering from Virginia Tech in 1988 and did her graduate work at Perdue University. Her team includes Martin Daniel, associate vice president for research operations; Srinath Ekkad, associate vice president for research programs; and Elizabeth Tranter, associate vice president for research planning. As the team’s financial manager, Daniel embraces the research office’s purpose. 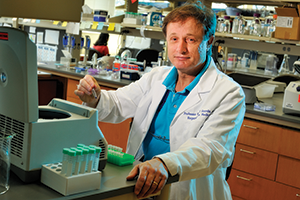 “Our mission statement is to empower the faculty to do world-class research,” he explains. Because the role involves facilitating research, Daniel says helping commercialize products resulting from research is part of the job. To that end, he cites two campus nonprofits: Virginia Tech Intellectual Properties — VTIP — and VT KnowledgeWorks. VTIP licensed the biohydrogen patent for Percival Zhang’s “sugar battery,” a biodegradable, rechargeable fuel cell created in 2014 with colleague Zhiguang Zhu in Tech’s Department of Biological Systems Engineering. Their prototype battery, which is the size of an AA alkaline, runs on maltodextrin, a cheap carbohydrate used in processed foods. The researchers started Cell-Free Bioinnovations Inc., which now has four full-time and three part-time employees. Its CEO is Ed Rogers of Charlottesville. “The company intends to pursue and execute exclusive strategic collaboration agreements with global companies that have the resources to bring new products to market,” Rogers says. In addition to developing a battery that might power tomorrow’s electronic devices, the company has initiated work on three new products, including biohydrogen made from low-cost sugars instead of natural gas. Rogers says potential investors are enthusiastic. That’s exactly the kind of commercialization of research Tech likes to see. Tranter says creating systems for business-university collaboration is a goal. Her focus involves interfusing research and business. “It involves industry doing what industry does best and universities doing what they do best in creating forums where they come together,” she says. Ekkad certainly represents this union. Before coming to Tech as a professor, he was a mechanical engineer designing aircraft components for Rolls-Royce North America. The corporate relationship proved helpful when Tech and the University of Virginia partnered with Rolls-Royce to conduct research. Nowhere is the partnership between industry and academia more evident than at the Virginia Tech Transportation Institute (VTTI). Since its start with a staff of 15 in 1988, VTTI has grown to become the largest university transportation institute in the country for federal and private-sector funding. It now has 500 employees. VTTI also has 70 government and industrial sponsors. Every major carmaker has used the institute’s Smart Road, a 2.2-mile highway with cutting-edge technology including equipment that can replicate almost any weather condition. The test bed has seen more than 1,000 auto, truck, bicycle, pedestrian and motorcycle safety projects — often resulting in changed U.S. laws and policies. VTTI recently signed a contract with the National Highway Traffic Safety Administration to conduct safety testing on automated vehicles, says Tom Dingus, VTTI’s director since 1996. Noting that there are five levels of autonomous vehicle technology, Dingus says VTTI primarily is looking at Level 2 (L2) vehicles for this study. These are vehicles where two controls are automated in unison, such as adaptive cruise control in combination with lane centering. “Level 5 cars are cars that drive themselves while you play Parcheesi in the back seat,” Dingus quips, noting that L2 technology “means hands off and feet off, but you still have to pay attention. It won’t change lanes by itself.” Level 3 technology, however, allows drivers to take eyes off the road. Last October, VTTI took its specially built Cadillac with L3 technology to Northern Virginia’s I-95 corridor for a demonstration showcasing the semiautomated car on a public road. VTTI has partners in Northern Virginia where more than 60 roadside equipment units along busy highways provide data on connected-vehicle research. Here, the roadside units wirelessly send alerts about such things as traffic congestion to cars equipped with connections. Dingus says that while L2 cars are already being produced, L5 cars are probably 20 years away. “That’s not that far,” he says, predicting that companies such as Uber and Lyft someday may do away with drivers and go to self-driving cars that people can summon with the touch of a button. The whole transportation service model could change so that the typical American doesn’t even own a car but chooses on-demand driverless car services. Whether we own a car or not, one thing is certain. The future is near. Another certainty? Virginia Tech is helping invent it.